Paul Leni, the director of Waxworks (1924), was an Expressionist painter who had worked with Max Reinhardt as a set designer and poster designer for th e cinema. 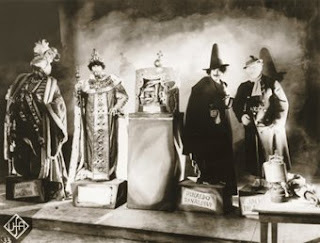 The essence of Waxworks is said to be taken from the German title of The Cabinet of Dr. Caligari (1919), "Das Kabinett Des Dr. Caligari”: the German title of Waxworks was “Das Wachsfigurenkabinett”. It was supposed to be a deliberate amplification of the fairground ambience, but with a more skilful technique. The screenplay was written by Henrik Galeen, who had also done the scripts for Murnau’s Nosferatu (1922) and Wegener’s The Golem (1920). Here, instead of one tyrant, Galeen gives us three tyrants, played by Emil Jannings, Conrad Veidt, and Werner Krauss. In three successive episodes based on the imaginations of a starving young poet after looking at past tyrants being exhibited in a houses of wax. architectural details in the first two episodes reveal Leni’s skill as a designer. 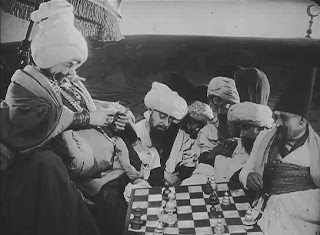 The roundness of the Oriental cupolas has a lively counterpart in the heavy turbans worn by the caliph’s courtiers. When the town of Baghdad appears, all light transparent curves, it is flat like the little diagrammatic town in Caligari, which has often been compared to the architecture in the paintings of Lyonel Feininger. For my film Waxworks I have tried to create sets so stylized that they evidence no idea of reality. All it seeks to engender is an indescribable fluidity of light, moving shapes, shadows, lines, and curves. Waxworks culminates in scenes which, exceeding their task of illustrating the plot, penetrate the nature of tyrannical pow3er. The insistence with which, during those years, pictorial imagination reverted to this subject indicates that the problem of absolute authority was an intrinsic concern of the collective mind. In this regard it is interesting that Sergei Eisenstein loosely used Waxworks as a model for some of his sets in Ivan the Terrible (1944). Leni went on to direct successfully in America, notably The Cat and the Canary (1927), before he died in 1929.